Rev Stephen Kingsnorth retired early from active ministry in August 2016 due to health reasons and both before and after his retirement there have been extensive discussions as to the future role and shape of Warrington Borough Ministry (WBM) within the Sankey Valley Circuit with the Liverpool Methodist District, the Liverpool Anglican Diocese and other ecumenical partners operating in the Warrington area. The Sankey Valley Circuit Leadership Team (CLT) considered the outcome of these discussions but after considerable debate rejected the proposals albeit with regret, as there was considerable awareness and appreciation for the extent of Stephen’s ministry over many years, however, the feeling was that it developed out of a specific need, which was kick started by the IRA Warrington bomb incident, but as time passes that need is no longer so acute, it was described as a season that has now finished. The Circuit Meeting accepted the report from CLT and offered sincere thanks to Rev Stephen Kingsnorth and the WBM Management Group for the work done over the many years of the ministry, but with regret approved the decision of the Circuit Leadership Team to withdraw Circuit financial support to Warrington Borough Ministry in its present form. What led the CLT to the decision not to recommend continuation of WBM to the Circuit Meeting? The Circuit has undergone a period of traumatic change in the last twelve months from which it is beginning to recover. With other significant issues to be addressed, the opportunity for reflection on WBM had not been possible. The CLT feels the Circuit has invested a substantial amount of money as the major funder of this work since the time that Stephen began this ministry in 1993. Much has happened during the time since this ministry started, in 2011 the old Warrington Methodist Circuit has combined with other Circuits to form the Sankey Valley Methodist Circuit with other significant centres of population such as St Helens, Widnes, Ashton and Golborne and it was felt it was time to look for opportunities to stimulate projects in other parts of the Circuit than Warrington. What was being proposed would be a very different type of ministry, part time instead of full time and probably lay instead of ordained; although a three year proposal was presented there was no plan as to what to do when this period was complete; as a result there were concerns that valuable resources might be used ineffectively. CLT also noted that the Baptist Church, which had been a strong supporter of WBM, had withdrawn from Warrington town centre and from WBM Management Group. There was also a strong feeling within CLT that with the retirement of Stephen this ministry had come to a natural conclusion. What could any possible future of WBM look like? It is uncertain what future there might be for this work but the CLT remains committed to ministry with ecumenical partners in Warrington town centre as evidenced by the recent meetings with Archdeacon Roger Reece ((Archdeacon of St Helens & Warrington) and Revd. David Easton (Sankey Valley Methodist Superintendent Minister). CLT believes the Methodist Church should continue to work together with ecumenical partners to relate to the civic authorities and other faith communities, whilst recognising that the strong links Stephen had were in a large part down to his own personal charisma but should ideally be continued in a way yet to be defined. To this end WBM Management Group have not been dis-banded and are continuing to explore opportunities that become available. Sponsored by the Methodist Church and other congregations. Supported ecumenically by Churches Together in Warrington and by other faith communities through the Warrington Council of Faiths. A reference point for faith enquiries. A representative voice from the faith communities on a wide range of bodies. A resource as various organisations and partners seek opportunities for events of spiritual reflection in non-traditional formats. Developing relationships between faith communities and a variety of non-faith agencies and authorities, serving as a reference point, a representative and a resource, through the building of relationships. Being alert to national, local, cultural… events, movements, signs… opportunities for specific faith-led activity. Serving as a representative from the faith communities, on groups, across the variety of sectors, facilitating a faith ear and voice. Being theologically aware of issues concerning the role of faith communities in relation to statutory authorities, and Christian communities in an interfaith context. Maintaining administration for Warrington Council of Faiths and Town Centre Clergy group. Being aware of the profile of Warrington, having particular regard for the town centre and its management; attending meetings of the Council etc to register the concern/interest/profile of the faith communities. Expecting to serve as a Faith representative to a variety of bodies. Expecting to serve as a Borough Liaison Officer for Churches Togther Warrington, & serve as the email conduit for CTW; maintain the Warrington Faith Communities’ Directory. Being prepared to work alongside those seeking the provision of acts of spiritual reflection for the unchurched. Expecting to be involved in regular or occasional services and events organised through WBC. During a special meeting of the Warrington Borough Council in February 2016, the Rev’d Stephen Kingsnorthwas granted the Freedom of the Borough of Warrington. This is the highest honour a Local Authority can grant and he Rev’d Kingsnorth joins a very short list indeed. There have been only five candidates granted this honour over the last 20 years and the Rev’d Kingsnorth is the only clergy. Rev’d Stephen Kingsnorth retired to Wales in June 2016. 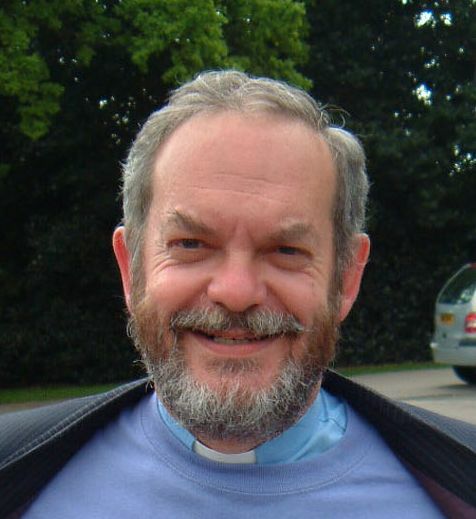 Rev’d Stephen Kingsnorth is also a trustee of the Wolves Charitable Foundation. Click on any image to expand it and then use the left/right buttons to view other images.